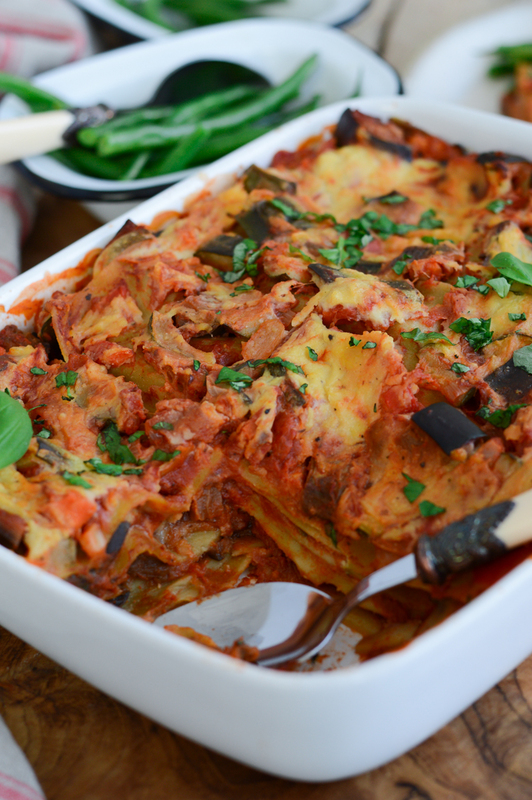 Classic Italian lasagna made vegan, gluten free and nut free. 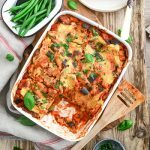 This meat free lasagna is great for a family get together, a dinner party or a weekly meal prep. You can make it ahead of time and serve later in the week (or it will keep in the freezer for a good 2-3 months). This lip-smackingly delicious vegan lasagna was another successful ‘experiment’ of my meat free January and I must say, I’m quite proud of this creation. 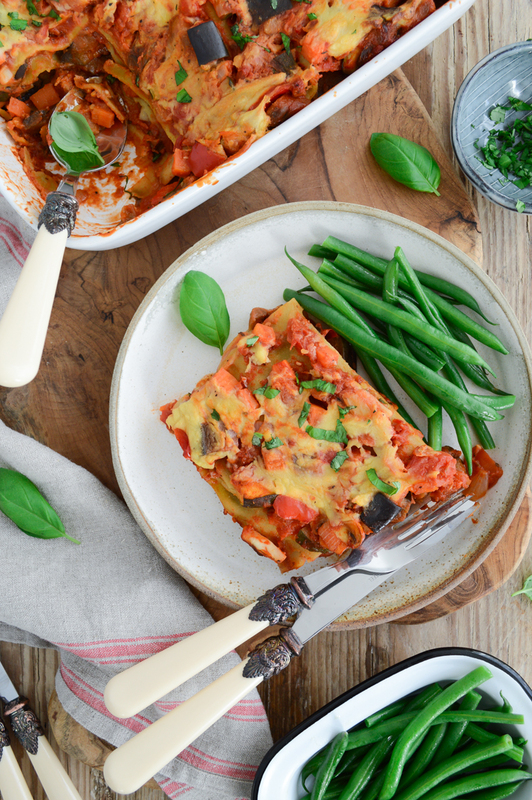 I don’t know if it’ll beat the records of my vegan shepherd’s pie, which is my most popular recipe to date yet, but I believe this meat free lasagna is a great contender! Made totally from scratch (well apart from the pasta sheets that is), this dish has become another firm family favourite. 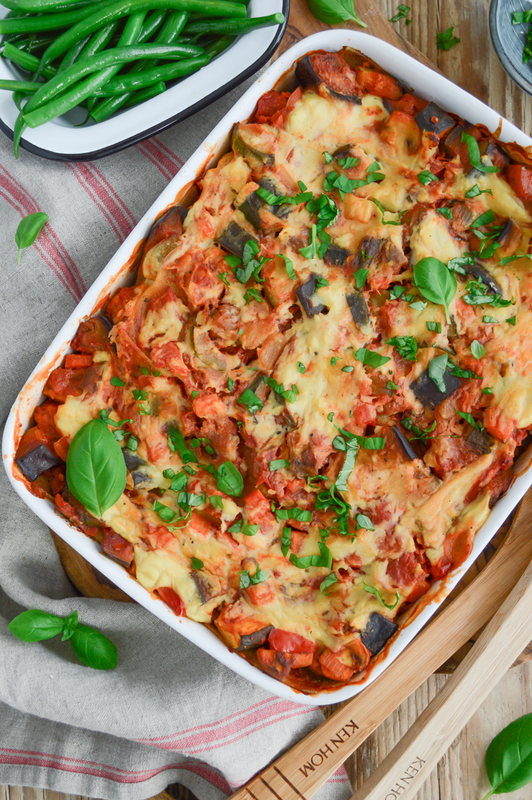 When I was making up the recipe for this vegan lasagna in my head, I wanted to create a cheesy-like sauce without nuts. 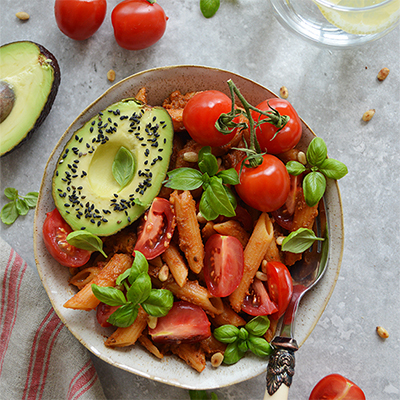 I know using cashews or almonds is very common when creating dairy free cheese but I consume a fair amount of raw nuts as it is (hence the name – Fit Foodie Nutter), so I was determined to leave them out. When I started brainstorming lasagna sauce recipe ideas in my head, I suddenly remembered that I’d bought a packet of agar-agar powder (vegan gelatin) to experiment with a dessert recipe for Valentine’s Day… What if I use the nutty flavour chickpea flour as a base for my sauce (which I had done once before) and thicken it up with agar-agar powder? I tell you what, it worked like a treat! I added a little sprinkle of nutritional yeast flakes to the sauce to give it a savoury ‘cheesy’ flavour. A word of warning though – I personally find that if you add too much nutritional yeast, it can get a little overpowering and the yeast flavour can get very pronounced, so feel free to use a little more than I stated in the recipe but me mindful not to overpower the sauce with yeast flakes too much. Although this recipe takes a little longer to cook than my normal recipes, I promise it’ll be totally worth it. It’s a great family size meal which both adults and children will enjoy (and will hopefully ask for seconds). 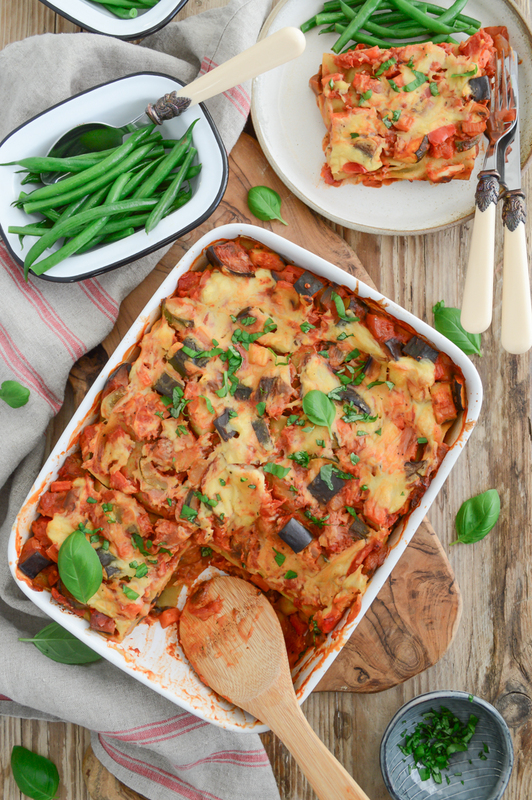 If you’re looking for a meal prep recipe for the week ahead, this lasagna would fit the bill perfectly. As always, I would love to see your creations of this ‘veganised’ old family classic and I would be thrilled if you shared your photos with me. Remember to tag me in your photos on social media and use the hashtag #fitfoodienutter so I could find your beautiful and delicious creations. Enjoy the recipe and see you next week. In a big pan (it has to be big enough to fit all the vegetables), fry onions & garlic in olive oil over medium heat for around 2-3 minutes until translucent. Add tomato puree, paprika and dry herbs to the onion mixture and cook for another minute. Now add all the chopped vegetables to the pan: carrot, courgette, aubergine, red bell pepper and mushrooms. Stir well and cook for around 6-8 minutes until the vegetables have just softened. Add tinned tomatoes into the pan with vegetables along with freshly chopped basil and salt & pepper, stir well and bring to a gentle bubble. Simmer for 8-10minutes until the sauce has thickened a little. You might want to taste the sauce at this stage and adjust the seasoning if required. Preheat the oven to 200C fan whilst we’re making the ‘cheesy’ sauce. To make the white sauce, over medium heat heat up 2 tbsp olive oil in a medium size saucepan. When the oil is hot, add sifted chickpea flour into the pan and keep stirring the flour with a wooden spoon trying to break down the lumps (for around 2 minutes). The mixture will start turning yellow, which is what we want to bring out the nutty flavour of the chickpeas. Don’t worry if your mixture looks lumpy at this stage – you’ll have a chance to smooth it out in a minute. After a couple of minutes, when the chickpea flour mixture has turned yellow, add 1 cup of water into the saucepan and start whisking trying to break down all the lumps. Add the remaining water and whisk again. Now add the agar-agar powder, nutritional yeast flakes and salt & pepper and whisk again. Keep stirring the mixture continuously to make sure it doesn’t stick to the bottom of the saucepan. You’ll notice the sauce will start to thicken after about 3-5 minutes. Once it’s thick enough (you’re looking for a similar consistency to bechamel sauce), take the saucepan off the heat. Taste and adjust the seasoning if required. To assemble the lasagna, line the pasta sheets at the bottom of the oven proof dish. Cover the sheets with a generous layer of tomato and vegetable sauce followed by a layer of the white sauce (use the back of a spoon to evenly spread the white sauce over tomato & vegetable mixture). Repeat the layers in the same order – pasta, tomato & vegetable sauce, white sauce. Cover the dish with foil and bake in the oven for 20-25 mins. Take the foil off and bake for a further 13-15 minutes until the top layer with white sauce has turned golden brown. This lasagna looks so incredible! I can’t wait to try it. Thank you so much Nicole. This is the first time I’ve used agar agar and I know I’ll be experimenting with it a lot in my new recipes. I love discovering new ingredients for myself – it makes the kitchen experiments more fun, doesn’t it?! We love making different kinds of lasagna. We will have to add your recipe to our list of delicious lasagnas. Thank you for sharing. I love the idea of using chickpea flour and agar-agar for the cheese sauce. Brilliant! I love lasagna! This recipe is fabulous. I love how you made it gluten-free and nut-free. That looks amazing! I love how creative you got and didn’t fall back on using cashews or almonds to get that creaminess! Thank you so much Pam! As much as I like nuts, I can only have them in moderation as I’m really glad the nut free experiment worked! 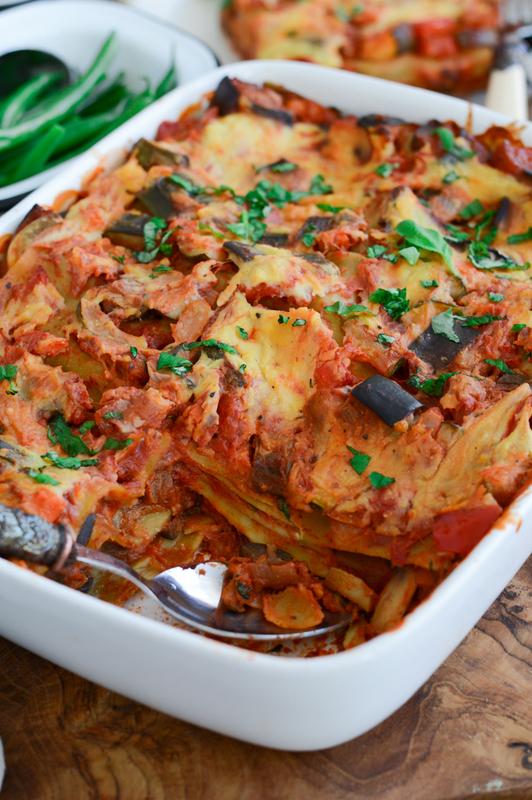 What a yummy looking vegan lasagna. Hard to believe it’s vegan and gluten-free! I love that all diets can enjoy a tasty lasagna! Thank you for sharing! Thank you very much indeed Jillian! This is right up my street! I love that you can make it ahead of time for easy weeknight dinners! 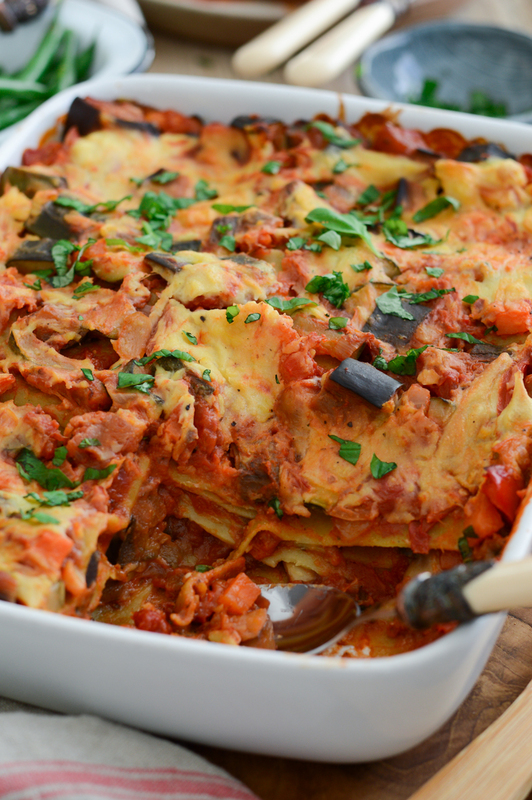 What a gorgeous looking lasagna Tania, my family would love this! And that dairy free topping looks perfect, you would never know it wasn’t cheese! This made me so hungry Tania! I’m on my way for a dinner at yours! Totally delicious my friend! Oh Anna, you know that I’d greet you for dinner anytime! I’m opening the wine – come over! This sounds delicious! I have never tried using agar agar in homemade cheese, what a great idea!